They tell you that you have to do it but they never really get around to telling you what IT is. You know them. You know the ever-present “they”. Well, they are right. You MUST do your bookkeeping. And I’m not just saying that because I’m in the bookkeeping business. I’m saying that because aside from having a separate business bank account, it’s one of the few foundational pieces of the business puzzle that’s vital to the success of a business. Could you get by without? Sure… but (1) not for long and (2) not without flying blind…making business decisions in the dark – by your gut instincts and a prayer. I don’t know about you but as much as I’m down for the woo-woo feelings of life, I think I’d rather take business risks that are based on something more than a gut feeling. I’d prefer to take calculated risks based on one of my foundational puzzle pieces. What is bookkeeping and accounting anyway? A lot of people don’t know the difference between bookkeeping and accounting. Most use the terms interchangeably but there is a difference. Definition of bookkeeping – Bookkeeping is the recording of financial transactions, and is part of the process of accounting in business. Transactions include purchases, sales, receipts, and payments by an individual person or an organization/corporation. Definition of accounting – Accounting or accountancy is the measurement, processing and communication of financial information about economic entities. As you can now see, bookkeeping is a part of accounting… once the bookkeeping (recording of transactions) is done, the accounting (measuring and analyzing) can be done. 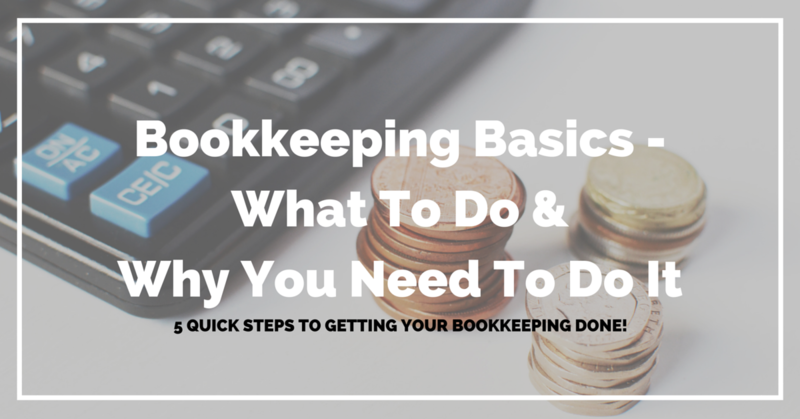 Now that we know what bookkeeping is and what it isn’t…let’s dive into what to do, why you need to do it & when you need to do it. After all, that is why you’re here… you probably want to know the bare essentials of all things bookkeeping. Okay, let’s cut to it then. Gather everything…invoices, bills, payroll docs, receipts, bank transactions, credit card transactions, etc. If you’re using a cloud-based program like Xero or Wave Apps, you will be able to automate a lot of this or use a smartphone app to upload them to the program. You can incorporate bank feeds, send invoices, upload receipts – from your laptop, tablet or smartphone. Now the fun stuff starts and this is where a lot of people give up…instead of doing it now, a lot of people opt to wait. Then they get overwhelmed at year-end when they need to meet their tax guy or tax gal. Depending on what program you use, this could be referred to a number of ways. Most frequently, it’s called “reconciling” or “matching” the transactions. How often you categorize your transactions is entirely up to you. I would recommend that you do it at least monthly because you don’t want too much time to pass. (Weekly is actually better). Too much time between when the transaction happened and when you categorize it will equal you having to spend time either racking your brain or researching what it is. Thus killing your productivity and making this way harder than it has to be. Commonly referred to as a bank reconciliation. You want to double-check the bank statement and its’ transactions (as well as the credit card statements and it’s list of transactions) against what was imported into your accounting software via the bank feed. You want to do this because as awesome as technology is, there can be hiccups. There have been occasions where transactions didn’t make it into the accounting software and I’ve had to manually create & reconcile them… so please don’t skip this step. This is when you start getting in the accounting side of things. You want to look at your general ledger (or account transactions report), your profit and loss statement and if you have created a budget, you want to also look at your budget versus actual report. Want more information on what to lookout for? Grab my Money Matters Checklist. Do it all again. For as long as you’re in business. Until you quit running your business, this is your life… gathering the information, categorizing the transactions, making sure you have everything and reviewing it all. When you have the information you need, all of the information, you will be able to make business decisions – like when to hire an assistant, when to invest in training programs, when (and how much) to pay yourself. Without a solid financial foundation, you can’t make any of these decisions… at least not one that minimizes risk. Knowing what to do and why you need to do is half the battle. 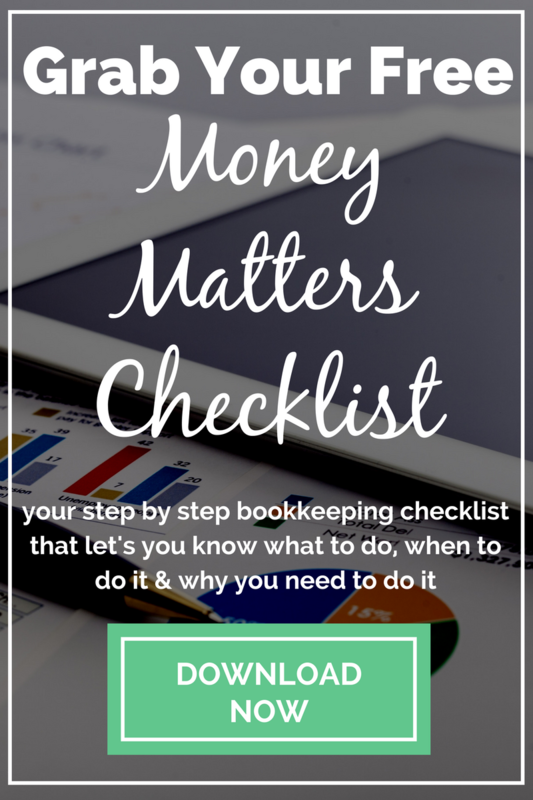 It helps to know WHEN to do it all too so grab my Money Matters Checklist. It includes, the what to do, why you need to do it AND when to do it… broken down into weekly, monthly, quarterly and yearly mini-lists. That’s the end of the bookkeeping show… not nearly as bad as you thought it would be, right? Kinda mundane and boring. Believe me, I know. But this is just the tip of the excitement iceberg. If you’re a numbers nerd, like me, the fun is really in the analysis. When you have the transactions categorized properly and a clean set of books…you can dive in and start creating scenarios based on those numbers. You can start to see the trends… where you will be in 3 months or 6 months. And that dear friend, is kinda my thing. Editor’s note: This post was originally published in June 2016 and has been completely revamped and updated.